﻿﻿25 degrees last weekend, almost one week of sun and warm weather. The snow in the mountains is melting… Spring is right here! So today we are presenting you this crag, which is perfect for this season, Sadernes. 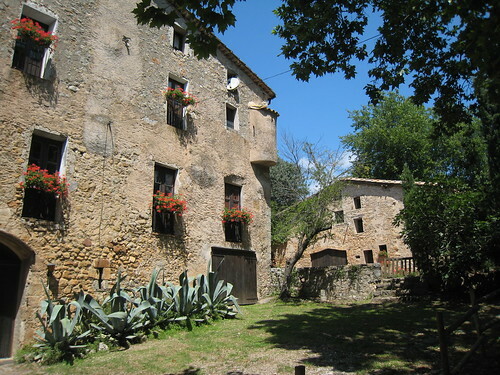 Sadernes is part of very small town in the north east of Catalunya called Sales de Llierca, in the region of la Garrotxa. 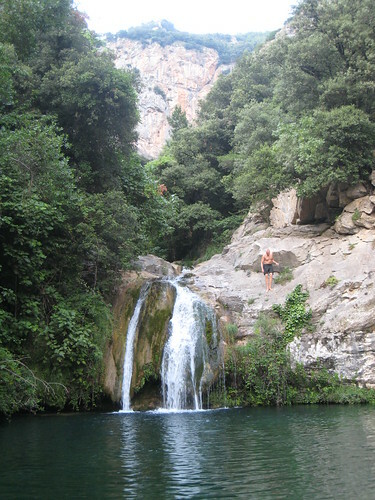 This natural park is well-knowned by its amazing canyon, with lots of small pools and ponds of green and blue water. But we are not here for the swimming (or yes? ), we came for the climbing! 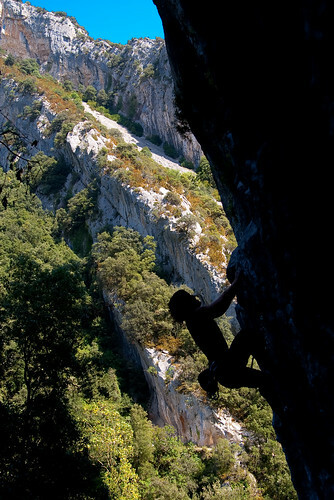 The good point about Sadernes is that you can go there either you are searching for climbing in the sun or in the shadow, as you’ll find both orientations at the same time, you just have to choose one side of the canyon or the other. During the midday it’s a bit hard to get shadow in summer, but it’s the perfect time to lay down and enjoy the water. Pont d’en Valentí: perfect sector for the middle of summer, when the heat is really strong, you won’t see the sun in the whole day. You’ll find 15 meters of slightly to not-that-slightly overhanging limestone with a lot tufas and crimpers. Powerful climbing, combination of athletic movements with some technique. You can find from 6a till 8b+ (or a little bit more), but most of the routes are arround 7a and it’s not worth it if you do not climb, at least, this grade. La cúpula: another really fresh sector, it’s only climbable if the river is more or less dry. Here you’ll find the most amount of hard routes of the crag, between 8b and 8c+. It’s quite more overhanging than Pont d’en Valentí. La Cova del Bisbe: you want to climb first hour in the morning?. Here you’ll find really long routes with shadow until more or less 13.00. Normally starting with grey 6th grade limestone slabs with a lot of crimping, following with 7th grade second pitches (you can join both pitches with a 70 meters rope) of really technical movements on nice orange vertical rock. Special mention to “Punyalada”, a 7a+ following an amazing 10 meters tufa. But that’s not all! Sadernes is a perfect place to stay a lot of days, and enjoy all it’s possibilities: trekking, climbing, biking, walking, canyoning or just lie down and enjoy the life. How to get there: the best option is to fly with RyanAir to Girona’s airport, and then by car you’ll be there in less than an hour. If you come with your own car, you better come through the AP-7 and then, next to Figueres, drive to Besalú. Pass by this really beautiful medieval village and drive to Montagut i Oix. From there follow the Sadernes signals. Camp site: You’ve got 3 camp sites close to the area. The closest one to the crag is Camping Sadernes but is often crowded an you may prefer to be a little less stressed. So the other options are: Camping Montagut and Camping Can Banal. Caravaning: if you are coming with your van, there is the option to sleep in the car park in the entrance of the valley, from there you’ll have 20 minutes walking to the first sectors. Topos: we are currently working to offer you to buy online the guide of this crag. Meanwhile you can buy or consult it at the Camping-Masia Sadernes. if you come by car, there is also the option to drive to the parking places next to the sectors, but remember that in summer, the park guards close the road at 9.00 in the morning, so will have to enter before that time. is not possible to climb in some sectors, ask the guards or at the camp site where is possible to climb and where is banned. There are also some posters arround the crag car parks informing where you are allowed to climb and where not. Tagged with Crags, sadernes, taste-menu.